Picking up where Roomba leaves off, the Braava has three different cleaning modes to tackle challenges that just aren't appropriate for a robot vacuum cleaner. The new iRobot Braava isn’t as cute a robot as BB8, but it probably smells a lot better. 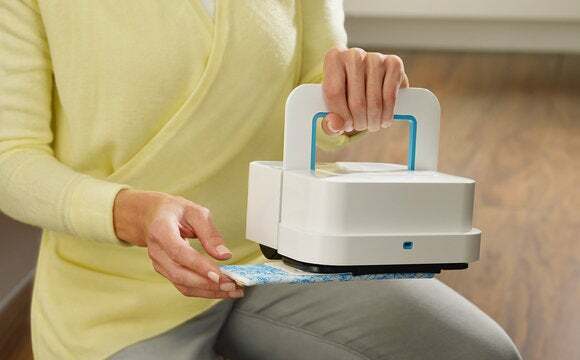 Picking up where iRobot’s Roomba vacuum-cleaning robots leave off, the $199 Braava uses a water sprayer and detergent-laced cleaning pads to tackle spills, grime and general ickyness on bathroom and kitchen floors. That’s right: It’s a mopping robot. So now your Roomba can have company in the custodial services wing of your connected home. I saw the Braava in action, and its robot navigation bore all the trademarks of iRobot’s Roomba path-finding algorithms. The Braava scurried back and forth over a hotel bathroom floor with efficiency and aplomb, and had no problem cleaning corners and hard-to-reach places. 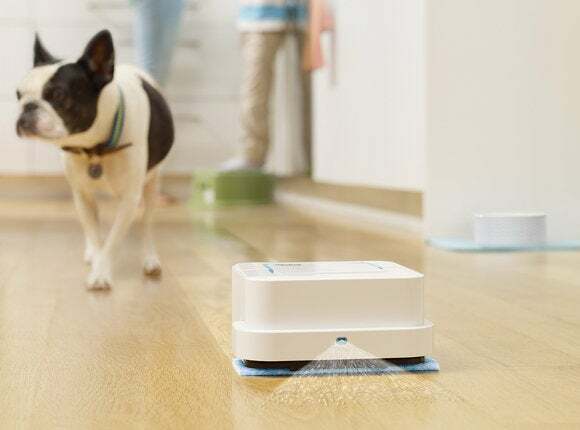 But where the Roombas use suction power, the Braava uses three different types of cleaning pads to mop tile, stone, and sealed hardwood floors. A box of 10 replacment pads costs $8. Simply insert a cleaning pad (they cost $8 for a box of 10) and a unique code on the pad will tell the Braava which cleaning mode you’ve selected. The Dry Sweeping Pad is akin to the original Swiffer sweeper. 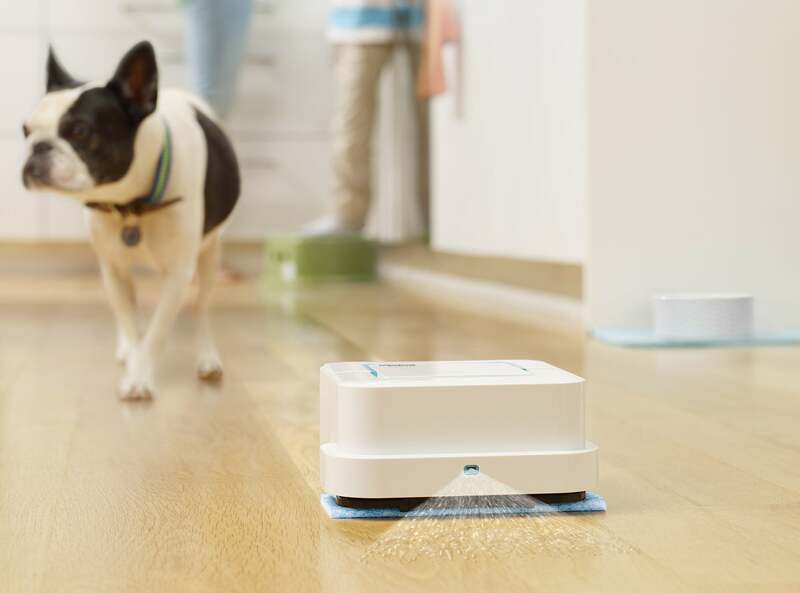 In this mode, the robot does a single pass of your floor to clean up dirt, dust, and other undesirables. Insert the Damp Sweeping Pad, and the Braava will spray your floor with water as it does a double-pass over its environment. In this mode, the cleaning head vibrates to loosen up the dirt. Finally, if you insert a Wet Mopping Pad—which is laced with a pleasant-smelling detergent—the Braava will do a triple-pass of your floors, spraying water and vibrating its cleaning head to tackle the worst dirt and stains. Just like the Roombas, you can set up Virtual Walls to keep the Braava from leaving a certain area. But even without those accessories, iRobot’s room-mapping logic can keep the Braava in a confined area if you start your cleaning cycle with the robot leaning against the same wall that has the room’s door. Don’t let the rendered water fool you: The Braava does spray flooring in its path. Or, you can simply close the door, and the Braava will stay locked inside (and safely away from easily terrorized pets). 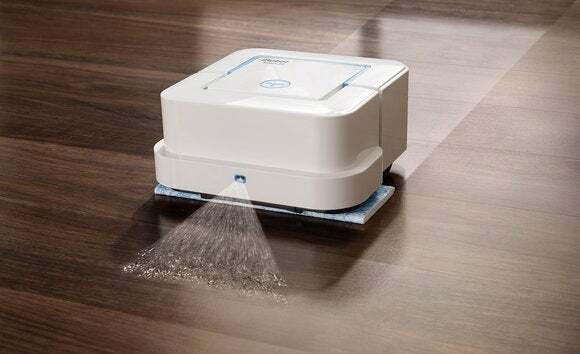 The robot is rated to clean up to 200 square feet in its Dry and Damp modes, and up to 150 square feet in its Wet Mopping mode. The Braava doesn’t appear to need much maintenance. You must fill it with water by hand, as well as connect it to a charger when its Lithium Ion battery needs more juice (it doesn’t automatically return to any type of docking station, a la the Roombas). But you need not worry about handling dirty cleaning pads: Just hit the eject button, and spent pads will drop into the trash. Does it clean up major disasters like splattered marinara sauce and sticky, two-day-old soda? I don’t know. The iRobot team did the Braava demo in an immaculate hotel bathroom. But I did see that Braava easily mop up a coffee spill. Only real-world testing will show us just how far we can push this thing.